This year we decided to not exchange gifts. Not under the tree with the kids I mean, but family wide. It seems every year we draw names for the adults and then spend 4 weeks agonizing over what to get “Uncle Joe”, when in fact we know NOTHING about Uncle Joe. True story: A few year ago we did get picked from a family member we LIKED but knew nothing about his likes. SO we bought him one of those glass paper weight jellyfishes. Like from a mall kiosk. I still bust out laughing thinking about it. That’s pretty much how all adult exchanges go. So while we are not exchanging gifts this year, I still wanted to let the kids gift something to their family and what better than a memory. 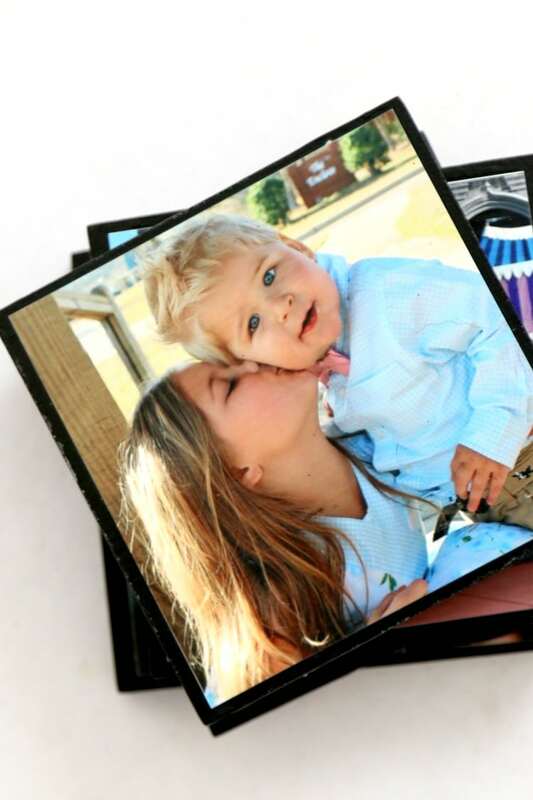 You can say so much with photographs, they are easy to work with in a variety of mediums, and it definitely qualifies as a “gift from the heart” category. 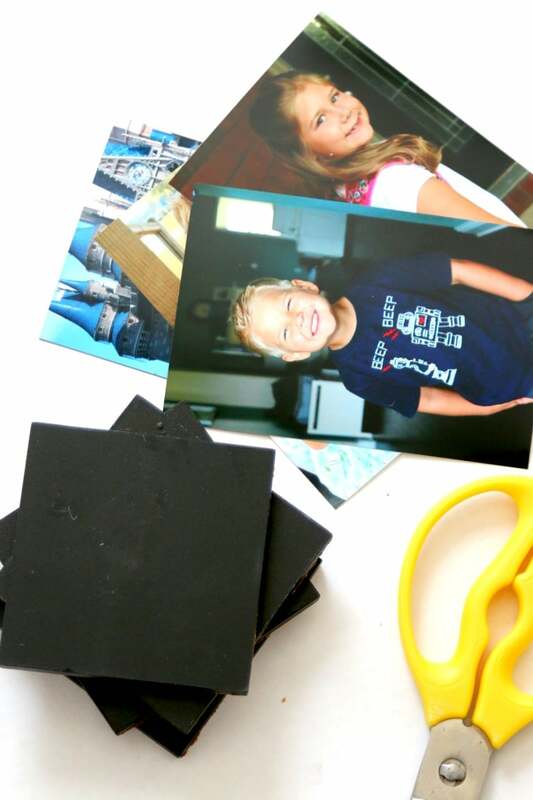 Now I am going to be sharing a few photography crafts this week courtesy of a partnership with CVS, so I hope you have lots of prints ready to go. If you don’t, no worries, you can pick them up same day printing and these 4x6s below were just 19 cents. Modge Podge is the KEY to pretty much any coaster or photo project you have out there. There are tons of DIYs on how to make your own but skip making your own. 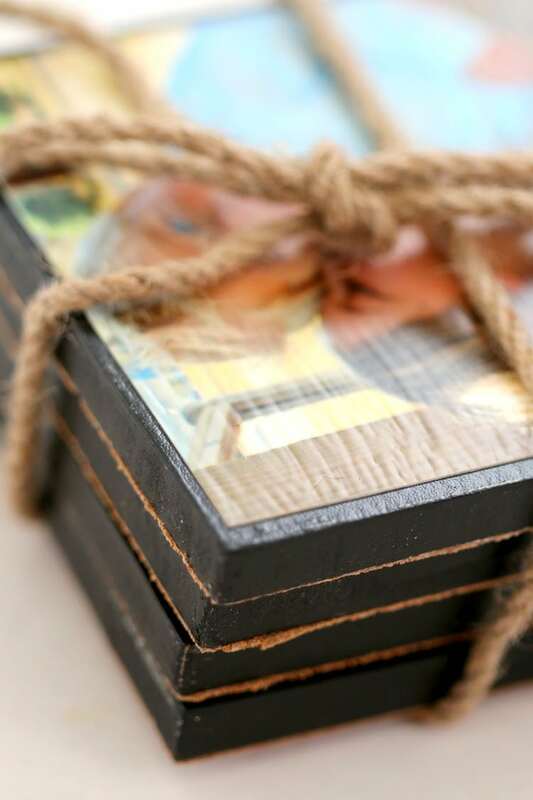 You can buy modge podge for nearly every occasion and with every kind of finish, but one of my very favorites is the Modge Podge Antique, which is what I used for this project. This is also one crafting staple that EVERY crafter must have..you can use it for so much! You can’t always get this in the stores, so pick yours up here! 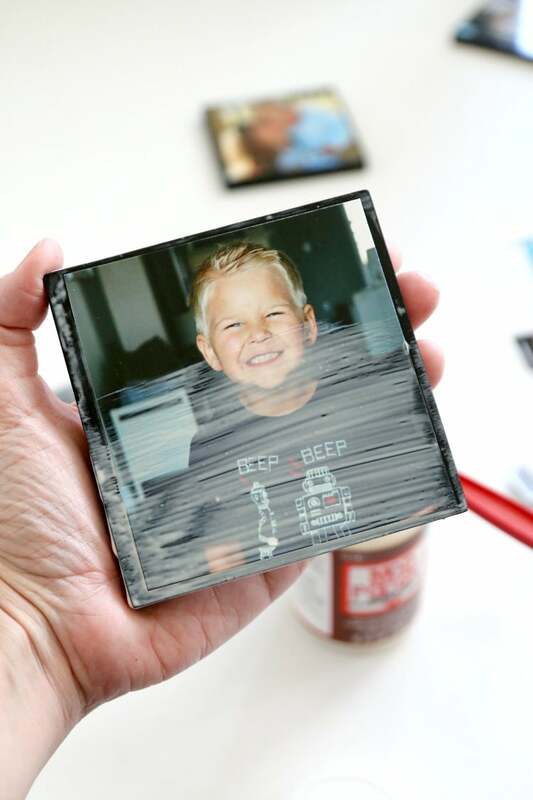 You may have seen DIY Photo coasters done 100 ways online but for me, there is only one way to do them. EASY and INEXPENSIVE. 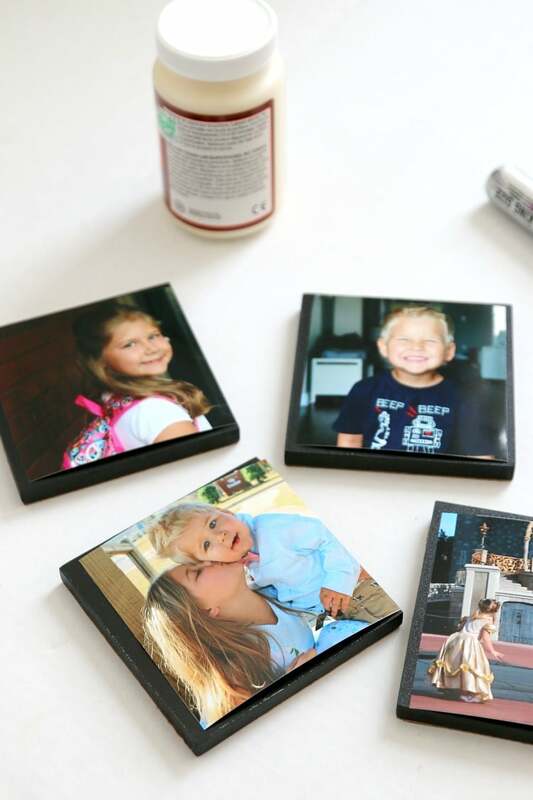 And once you learn how simple these are to create, you can easily replicate this entire process on a variety of sources to create magnets, tiles, glasses, pretty much anything you want. 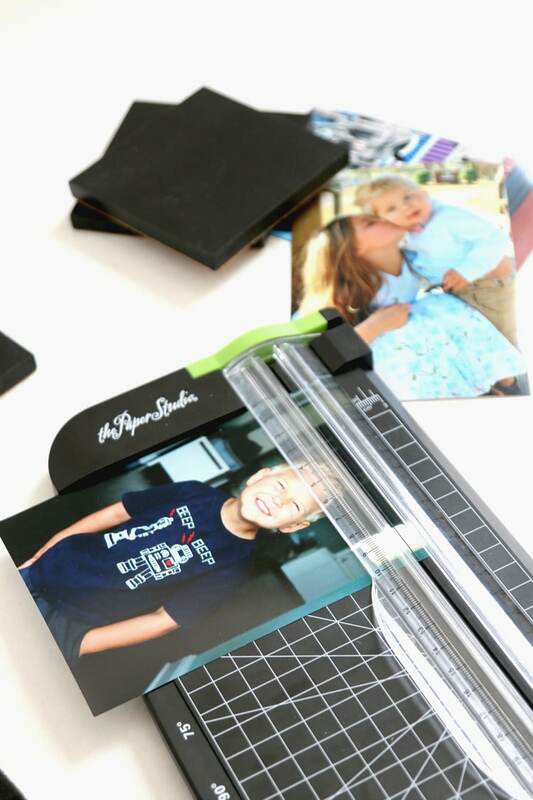 Pictures – 4×6 photos work well for this and I used the same day printing at CVS, uploaded, and then ran by and picked up the prints -also they have an on page coupon right now and it took 30% off my purchase. You can get it here. 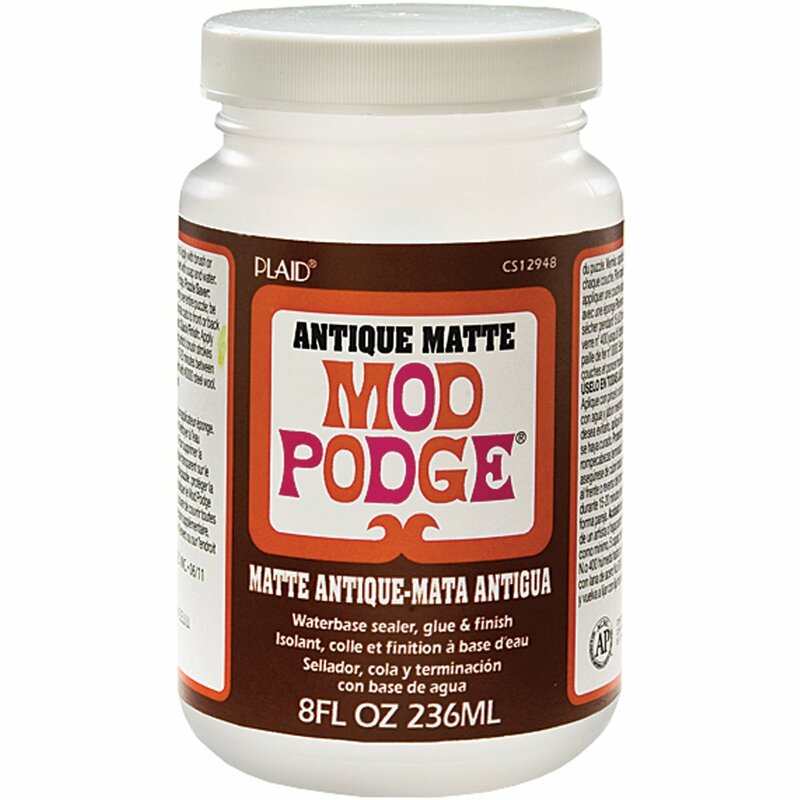 Modge Podge: I used the antique for a different flare, but there are many other choices that include matte, glossy, etc. coasters: I bought unfinished coasters with a grip bottom for $7.99 at Hobby Lobby. You could also use real tiles and add a felt bottom, wood squares, pretty much the sky is the limit! 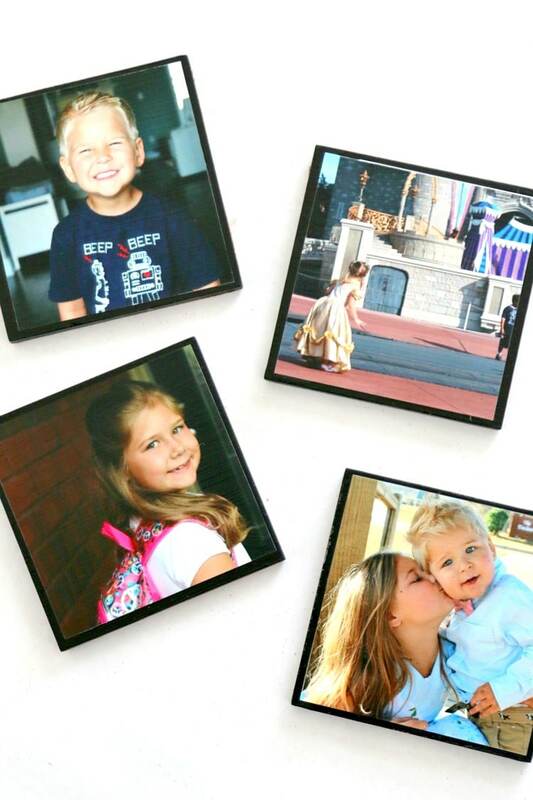 The first thing you have to do with making your coaster set is to make sure all the photos you are going to use are the right size. I decided I liked the look of the dark coaster itself so I didn’t want to bring my photos to the edge and instead cut them so I had a small black frame around them. Personally, I just eyeballed it and trimmed a little at a time with my paper trimmer until I was pleased with the result. 2. 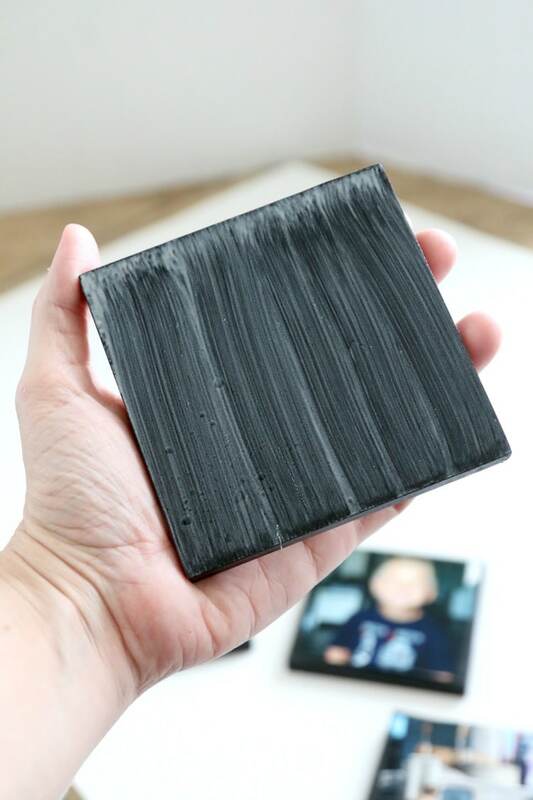 Now you need to apply a healthy coat of Modge Podge on your coaster and then apply your photo. You can let dry all the way and reapply as needed if any edges are up, but I am not a perfectionist, so I placed the Modge Podge, added the photo and then immediately added another layer of Modge Podge on top. That’s all there is to it! Now just let dry.